Big data is big -- but just how big may surprise you. According to a new QuinStreet survey, 77 percent of respondents consider big data analytics a priority. Another 72 percent cite enhancing the speed and accuracy of business decisions as a top benefit of big-data analytics. And 71 percent of mid-sized and large firms are planning for, if they are not already active, in big-data initiatives. And based on what I'm hearing this week at the HP Discover conference, much of the zeitgeist has shifted from an emphasis on cloud benefits to the more meaningful and long-term implications of big data improvements. 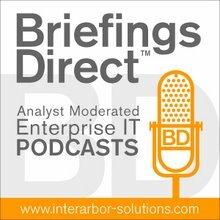 I recently discussed in a BriefingsDirect podcast how big data’s big payoff has arrived as customer experience insights drive new business advantages. But there are also some interesting case studies worth pointing out as we look at the big momentum behind big data. Despite the hype, big data may deliver productivity goods and benefits better, bigger than, and earlier than, cloud for enterprises and small and medium-sized businesses (SMBs) alike. We’ve been able to do some deep analytic research on what that is and get valuable information. Auto racing powerhouse NASCAR, for example, has engineered a way to learn more about its many fans -- and their likes and dislikes -- using big data analysis. The result is that they can rapidly adjust services and responses to keep connected best to those fans across all media and social networks. BriefingsDirect had an opportunity to learn first-hand how NASCAR engages with its audiences using big data and the latest analysis platforms when we interviewed Steve Worling, Senior Director of IT at NASCAR, based in Daytona Beach, Fla. at the recent HP Discover 2013 Conference in Barcelona. The discussion is moderated by me, Dana Gardner, Principal Analyst at Interarbor Solutions. Meanwhile, Nimble Storage is leveraging big data and the cloud to produce data performance optimization on the fly. It turns out that high-performing, cost-effective big-data processing helps to make the best use of dynamic storage resources by taking in all the relevant storage activities data, analyzing it and then making the best real-time choices for dynamic hybrid storage optimization. BriefingsDirect recently sat down with optimized hybrid storage provider Nimble Storage to hear their story on the use of HP Vertica as their data analysis platform of choice. Yes, it’s the same Nimble that this year had a highly successful IPO. The expert is Larry Lancaster, Chief Data Scientist at Nimble Storage Inc. in San Jose, California. The discussion is, again, moderated by me. When you start thinking about collecting as many different data points as we like to collect, you have to recognize that you’re going to end up with a couple choices on a row store. That was what piqued his interest at first. But as he began to use it more and more at Glassbeam, where he was previously CTO, he realized that the performance benefits you could gain by using HP Vertica properly were another order of magnitude beyond what you would expect just with the column-store efficiency. The healthcare industry is also turning to big-data analytics platforms to gain insight and awareness for improved patient outcomes. Indeed, analytics platforms and new healthcare-specific solutions together are offering far greater insight and intelligence into how healthcare providers are managing patient care, cost, and outcomes. To learn how, BriefingsDirect sat down with Patrick Kelly, Senior Practice Manager at the Avnet Services Healthcare Practice, and Paul Muller, Chief Software Evangelist at HP, to examine the impact that big-data technologies and solutions are having on the highly dynamic healthcare industry. I moderated the discussion. Medical information can be sensitive when available not just to criminals but even to prospective employers, members of the family, and others. Muller said dealing with large volumes of sensitive personally identifiable information (PII) is not just a governance issue, but it’s a question of morals and making sure that we are doing the right thing by the people who are trusting themselves not just with their physical care, but with how they present in society. So with all this in mind, how big will big data get? It’s not clear. The challenges are as big as big data itself but the QuinStreet survey suggests survey responses are pressing forward, with 45 percent expecting to data volumes to grow 45 percent in the next two years along.